Cette maison est une réplique d'un cottage victorien avec des détails authentiques. Le porche a des supports âgés de 120 ans soutenant le toit avec des balustrades en fonte. Le salon a des sols en vieux pin avec travertin dans un bain et la cuisine, l’autre avec des sols en marbre. Nos armoires de cuisine sont fabriquées à partir de cyprès anciens provenant d'anciennes demeures de la Nouvelle-Orléans. Tous les appareils sont mis à niveau. Les meubles sont faits sur mesure ou des antiquités. Une chambre à coucher a un lit à baldaquin en cyprès et l’autre un lit à haut dossier en chêne antique. Un porche filtré a manger à l'extérieur et une zone de couchage supplémentaire. Un pont attenant a une autre table et des chaises ainsi qu'un gril à gaz. Un petit foyer est parfait pour les nuits fraîches. My husband and I thoroughly enjoyed our stay in this delightful Victorian Style Cottage. The neighborhood was charming, close to the beach, near Old Town, which has many attractions to offer! The cottage was immaculate, well stocked, nicely decorated. Loved the antiques, folk art, N.O. touches, layout of the rooms, well stocked kitchen as well as other rooms, most especially the screened in back porch. Wonderful place to "hang out". This will be our BSL rental property of choice whenever we visit!! Thank you!!! Had a great stay in Bay St. Louis, MS. The house was small but beautifully appointed and had everything one would need. Bill was very helpful in answering all of our questions and offered suggestions on where to go and what to see in the area. The house is closed to groceries and shopping. 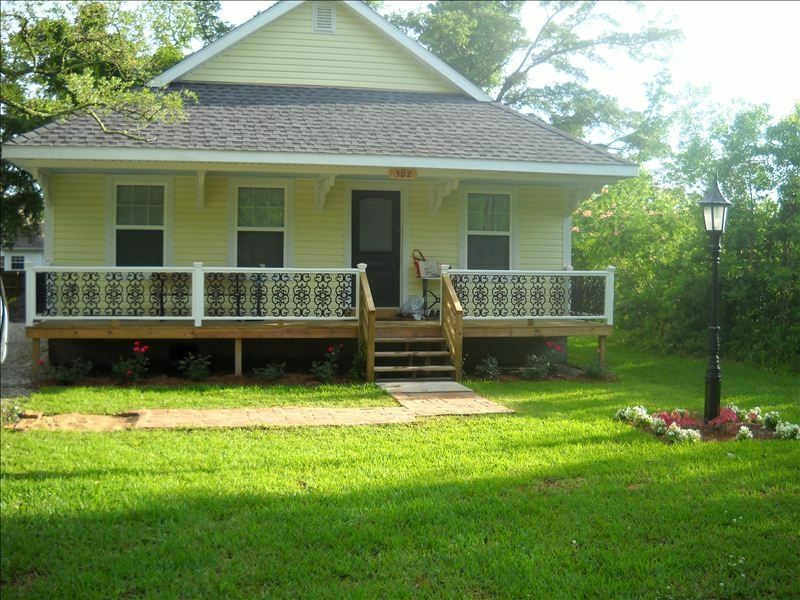 Great location, between Biloxi MS and New Orleans. Enjoyed our stay, thank you Bill. House was delightful! Had everything we needed just needed to bring clothes and personal toiletries. A very lovely home from porches to enjoy, very comfortable beds , nice furnishings and well stocked kitchen and bath. The check in was smooth from email notification and flashlight to help with lock box. It was a great hub for our daily adventures to Bay St Louis, Gulfport and Beloxi. Also short walk with pups down to sea wall and beach area. We LOVED the house! It's beautiful. We got in very late and the owner left a flashlight to help us get inside! The house is very tastefully decorated and very comfortable. My daughter loved how high the beds were. The kitchen is very well stocked with everything you could need. We even managed to cook Thanksgiving dinner! The neighborhood was very quiet and just a short drive to downtown. Bill was easy to work with and was able to accept our reservation on short notice. We were suppose to head to the Florida Gulf Shores the day Hurricane Michael was to make landfall. We were able to make a last minute cancellation, and we found Bill's place in Bay St Louis. The property was perfect, clean, in a quiet neighborhood and included everything you need. We tend to always take more stuff than we need, and really could have left most of the stuff home including the kitchen sink. The home is decorated with great art work and furnishings. The beds were comfortable. The TV channels also include the Fox Sports channel so we could watch the Nashville Predators. We will be returning to the property in the future. Bay St Louis is a great beach and Gulf Shores get away without the typical crowds. It has interesting shops, and good restaurants.